It’s Bourbon Heritage Month, not only here at Top Ten Liquors, but all over the country! Back in August of 2007, the US Senate declared September as “National Bourbon Heritage Month.” The bill reinforces the 1964 Act of Congress that declared bourbon “America’s Native Spirit” by celebrating the family heritage, tradition, and deep-rooted legacy that the bourbon industry contributes to the United States. You know what else is steeped in family heritage and tradition? BEER! With that, why not combine the two into one semi-quick read. This week, we’re diving into the art of large-scale bourbon barrel aging beers. Breweries that consistently have a bourbon barrel aged beer available on the market. It may not be the same one, but there is always something. If you think about it, that is a little insane. The number of barrels needed in order to keep up with the demand that is the current craft beer scene, thousands, depending on the spread of your distribution market. The barrel room at Central Waters in impressive, to say the least. 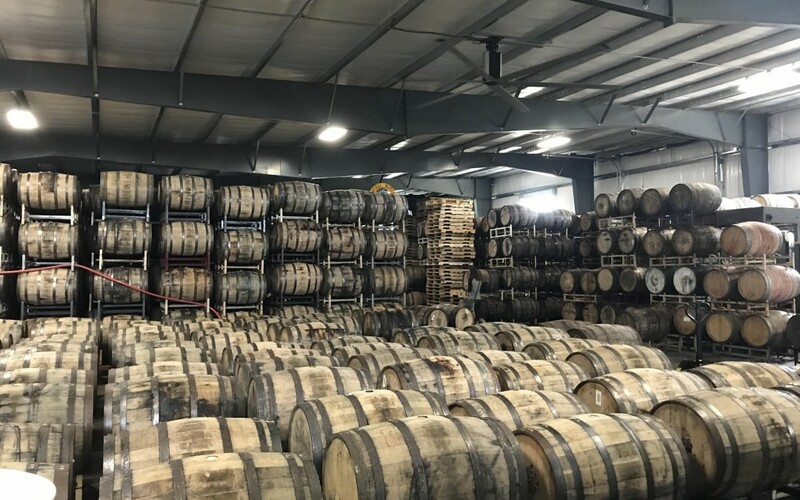 Stacks, typically four high, of bourbon barrels at least 5 or 6 rows deep fill their warehouse like a library whose books are oak vessels filled with a living organism maturing over years of being overlooked and passed by. The smell of oak, dust, and sweet malts fill the entire room. Back in 2001, Central Waters began the process of created bourbon barrel aged beers. They had no intention to become such a behemoth, but none the less, it grew and grew to the sea of barrels it is today. Proof that bourbon barrel aged goods don’t have to be the white whale that they’ve grown into. Cassian Sunset is their Spring/Summer release in their Brewer’s Reserve Series. This Stout, that was brewed with coffee from a local coffee shop, whole vanilla beans, and cinnamon which was then placed in oak bourbon barrels to develop. The resulting liquid as an intense nose of roasted malts, and coffee with accompaniments of bourbon, black licorice, and tobacco. Adding to the enjoyment of the aroma, the taste is first a dark, bitter roasted of coffee followed by brown sugar, vanilla, cherries, blackberries, and tobacco. All of this, mixed with a creamy mouthfeel, hide the large alcohol percentage. An intriguing Stout with an amalgam of flavors of which you should really try before your liver seizes up. For over 20 years, New Holland has been making Dragon’s Milk, which is insane to think about. 20 years ago, I barely knew how to multiply, and my multiplication skills are still questionable at times. Like Central Waters, New Holland’s warehouse has enough staves of wood wrapped in iron that they could probably build an entirely new brewery. Dragon’s Milk, unlike most any other bourbon barrel aged beer, is available all year round. Let that sink in. In all of the markets that they are currently in, they are able to manage a constant supply of Dragon’s Milk. With the repertoire and life behind Dragon’s Milk, there is a lot for it to live up to. Smells of bourbon are strong with this one with hints of roasted coffee, chocolate, oak, and Vanilla, your typical bourbon barrel aged Stout. On the palate, there are those same characteristics with the added bonus of caramel, malts, and raisins. The alcohol in this one is forward, but not to the point where it’s overpowering. The balance between the alcohol and the rest of the flavors is incredible. There is a reason that Dragon’s Milk has been around for 20 years, and who knows, the more you drink the better you may get at multiplying. It might be your eyesight multiplying objects, playing tricks on you, but it’s still multiplication. What was once a taproom one-off, Mondo Roboticus, a bourbon barrel aged Belgian-style Quad of which was brewed with Blood Orange, Avery‘s Tangerine Quad is a riff on that beloved taproom ale. The complexity of a Belgian-style Quad on its own, it a difficult beer to make, but depositing the liquid into a bourbon barrel to allow those complex flavors to meld with the competing flavors of the barrel takes a masterful hand of which combines art and science into one tasty conclusion. Aromas of bourbon, toffee, plum, oak, and vanilla with an underlying hint of tangerine. As it warms the tangerine begins to develop more taking a larger stake of the overall scent. On the tongue, the complex characteristics of a Belgian-style shine with grape, plum, dates, figs, tangerine, and raisins combine with notes of bourbon, vanilla, and yeast. A slightly bitter finish is the perfect ending to a fantastic swig. The alcohol is present, but it only adds to the complexity of the overall experience. Available year-round, it’s perfect for almost any occasion, grilling (pork chops anyone? ), cold nights around the bonfire, the dead of winter after you’ve shoveled your driveway for the fourth time in a 4-hour period, and even with some a celebratory drink after lugging the children around the neighborhood so they can collect their mounds of tooth-rotting sweets on Halloween!